Everyone has that one drawer, one countertop, one closet, or even one room that is full of clutter. From year-old bills to 10-year-old Halloween costumes, clutter can take up unnecessary space. Taking control of your clutter can seem daunting and overwhelming, but we are here to help turn your space from a cluttered catastrophe into an organized oasis (or something similar). Take the first step by setting goals. Figure out what you want to be accomplished and when you want to happen. Go even further by creating a schedule. Plan a time with all family members to go through clutter together. Involving the family will help keep everyone on track. Many organizing experts recommend the four-box approach: have a box for trash, a box for donations, a box for items to keep, and a box for items to relocate. Carefully consider each item before placing it in a box to make sure you are confident about which box to use. Leave no item unboxed. Once all items are placed in a specific box, follow through. Donate items that should be donated, throw away unwanted items, put back the items you are keeping, and relocate the others to their new home. Completing this immediately will help you feel accomplished sooner! Sometimes your clutter can be due to poor organization or neglect. Invest in storage options or organizers for important things. Bills beginning to pile up? Grab a mail organizer and label each slot as due soon, paid, and unpaid, or whatever works for you. Important documents lying about? Purchase a fireproof lockbox to keep all important docs secure and safe. Organizing the simplest of things can have a huge impact on your space. Having trouble noticing clutter? Sometimes we become blind to our mess and need a new perspective to help us notice things we’ve ignored! Inviting over friends or family will cause you to start thinking of your spaces as a visitor would. This new perspective can open you up to see your space differently. Take a photo of the space. If your eye is immediately drawn to a messy area, declutter it! Ask others what they see and use their perspective, too. Tackling clutter can be taxing, so don’t overdo it. Trying to do everything all at once will likely cause frustration and make you upset, which then results in being less efficient and losing progress. Take it a step at a time and take breaks when needed. Doing spurts of decluttering will result in a better finished product rather than rushing through just to “accomplish” the job. 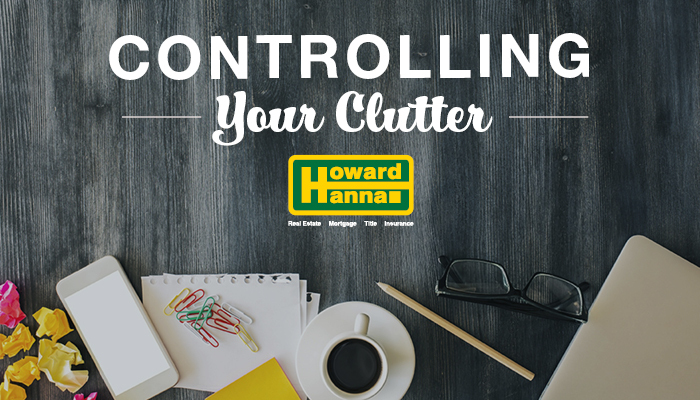 Taking control of your clutter will give you peace of mind and give your spaces an instant facelift! Here are more simple projects you can take on to help sell your home.